Nathan Osmond is a fresh new sound to the world of Country Music. He is signed on Pretty World Records and has experienced two #1 hits ("Sweet" & "The Tailgate Song"). His sound has been compared to Garth Brooks, Trace Adkins and even Vince Gill. This song was taken from a poem by Beecher Grogan, written on the 1-year anniversary of her daughter's passing from Cancer. Beecher requested that Country artist, Nathan Osmond take her poem and turn it in to a song. This song paints the feelings of mother and her words to her daughter. It helps to build hope that there truly is life after death. This song is being used as a fundraising tool as well as a way to bring awareness to Lucy's Love Bus, a nonprofit 501 (c)(3). 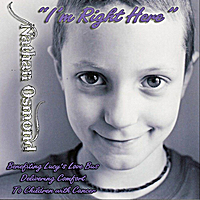 By downloading this song you are helping to deliver comfort to children with cancer. Be sure to check out the music video on Youtube.